These pages are currently under construction, as is Eniar. Check back often for changes. These pages, I hope, will help others, because I am writing these papers AS I am building, not afterwards. All my thoughts, mistakes, and successes will be here as they happen. They also shall help me, as I can now go back and see where I made a math error, or when a design flaw first came into being. I hope you enjoy watching Eniar take shape. Rmember, if you have any comments, questions, or suggestions, please contact me. Use another system, i.e. perhaps tri-star wheels, or whegs. Look into something new, like jumping, or flying. Anyway, I will probably get back to updating this more regularly soon. Keep your eyes peeled for more info on why my first attempts failed. 4/10: Front leg design, etc. Papers on Front leg design, sensor design, and basic walker shape are online. All the pages are now online. I'll be getting rid of typos for a while, but I can add to papers as I write them. 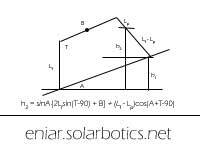 I got this site from solarbotics.net. 50megs, dedicated to robotics, without ads. Great stuff!